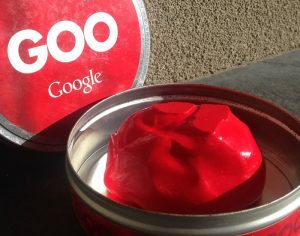 Extremely rare | Original Google Goo in metal container (round) as described on Google Goo page. Google Goo is no longer sold by Google. In original round metal tin container with air tight lid. This is an extremely rare, very collectible item. Shipping: Bubble wrapped and shipping in cart by registered POST. Cost included. Process: Using the buy now button, pay (PayPal), include a postal address and the item will be packed and shipped within 24 hours. Feel free to ask questions or talk to the seller here.